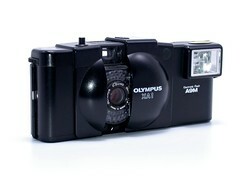 The Olympus XA series of cameras were an innovative range of very compact cameras in clam-shell cases. They were designed for Olympus by Maitani Yoshihisa. The XA series was largely replaced by the Stylus/mju series in 1991, but continue to have a cult following today. 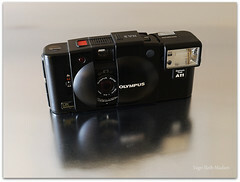 The XA, introduced in 1979 was the benchmark of the series containing a true rangefinder focusing mechanism and an aperture priority exposure system within its tiny case. It had a six element Zuiko 35mm f:2.8 lens, a CdS exposure meter and a shutter to 1/500. The aperture is changed thanks to a small lever. It is also possible to compensate the exposure by two ways : a lever at the bottom plate of the camera ensures a + 1.5 EV back light ; the ISO sensitivity lever, at the bottom of the lens, allows to change the value easily to under or to overexpose the frame. A self-timer is also available. Accurate focusing in a pocketable design, combined with convenient autoexposure, made this a very successful model. The XA2, introduced in 1980, was a simplified version of the XA with zone focusing and a programmed exposure system. 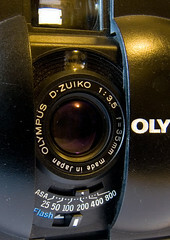 Its Zuiko 35mm f/3.5 lens had four elements in four groups. The exposure meter was a CdS exposure sensor above the lens. Shutter speed range was 2 secs. to 1/750. The minimum focusing distance was 3 feet or .9 meters. Its film speed range was ASA 25 -800. Limited supplies in white, red and blue were also produced. The XA1, introduced in 1982, was the cheapest and simplest of the series. It had a fixed focus four element 35mm f:4 lens, a shutter from 1/30 to 1/250 and a programmed exposure driven by a selenium meter. The only film speed settings were 100 and 400 ISO. 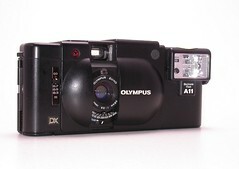 The XA3, from 1985, was basically an XA2 with DX film coding and manual ASA settings up to 1600 ASA. 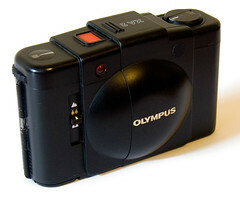 It also had the "backlight compensation" feature from the original XA, a feature lacking in the XA2. 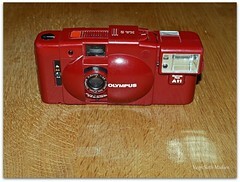 Like the XA4, it had easy film loading, requiring no threading on the take-up spool. A limited edition in red was also produced. 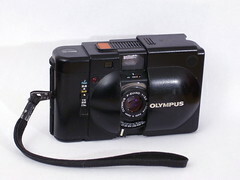 The XA4, from 1985, was much like the XA3, but with a wide-angle, 5-element Zuiko 28mm f/:3.5 lens. This could focus all the way down to a very close 0.3m, with the help of a plastic distance-measuring index attached to the wrist strap. Four different types of flash units were offered to use with the various XA models. All must be screwed to the left hand side of the body, and are very compact units. All auto flash models have settings for 100 or 400 ISO films. A9M, a purely manual flash. Uses one AA battery. 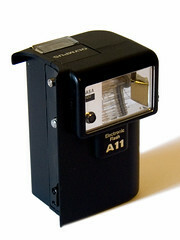 A16, a more powerful auto flash than the A11. Has settings for ASA 100 and ASA 400. Uses two AA batteries. 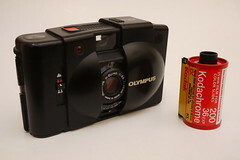 A1L, lithium batteries not replaceable by the user without dismantling the flash. A macro attachment was available for the A-11 and A-1L to use with the XA-4 at close focusing range. Cases were sold for both the body only, and for the body with a flash attached. 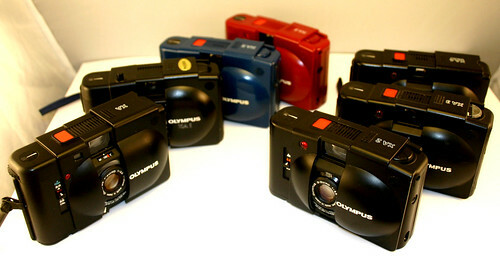 XA, XA2, XA1, XA3 in the Olympus Global History. XA and XA2 in G. Even's collection. Photobooks by Edwin Mak. Travel photography and Psychogeographic ephemera shot entirely on Olympus XA4. This page was last edited on 6 December 2017, at 11:40.